We are manufacturer and exporter of wooden handicrafts. 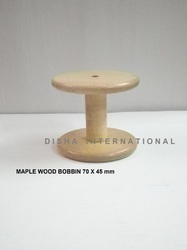 We make wooden bobbins and spools of all possible sizes in different varieties of wood as per buyer's requirements and specifications. Every buyer has different needs as per their territorial requirements, culture and public demand. If you tell us your specific needs we can give shape to any kind of bobbins in any variety of wood. We can even color the wooden spools as per your choice. Finish and smoothness on every spool is perfect to wind silk ribbon freely on these spools. 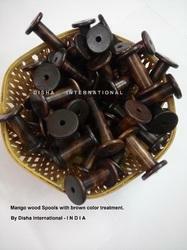 With the years of experience and expertise, we are engaged in offering a wide range of mango wood spools and colored brown to meet the demands of our clients. The complete range of our spools are made up of genuine mango wood and made of single piece that ensures their durability and smooth finishing. Moreover, we offer these products at very economical rates. This beautiful reel is made of maple wood by our expert artisans. It is well polished and finished to the perfection with smooth surface so that you may tie the silk or any other ribbon easily without entangling to the reel. Such reels can be made from other woods as well like Mango wood or Pine. We can customise your size and other designs also.